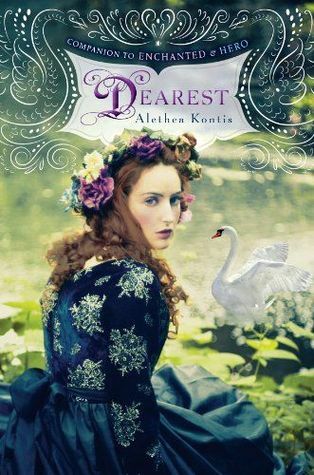 I really loved Enchanted and Hero by Alethea Kontis so it's not surprising this third book in the series about the Woodcutter sisters is just as good. Dearest focuses on Friday, the fifth oldest Woodcutter sister, who is a magical seamstress. Friday's carriage is a casualty of Saturday's flood, but luckily for her, a traveler discovers the unconscious girl and brings her to Queen Sunday's castle. While at the castle she stumbles upon seven sleeping brothers and falls immediately in love with Tristan. Unfortunately her beloved and his brothers are cursed to be swans during the day. Their sister holds the key to the salvation--but only if she can weave seven shirts from nettles before the new moon. Can Friday's special magic help the cursed siblings and save her true love? Fans of the Woodcutter sisters will not be disappointed with this installment. Although I enjoyed the first two a bit more, I still really like Dearest and would recommend it to anyone who likes fairy tales.